INDIANAPOLIS (October, 25 2017) – Chip Ganassi Racing (CGR) announced today that 22-year-old British driver Ed Jones has joined the team’s Verizon IndyCar Series program in the No. 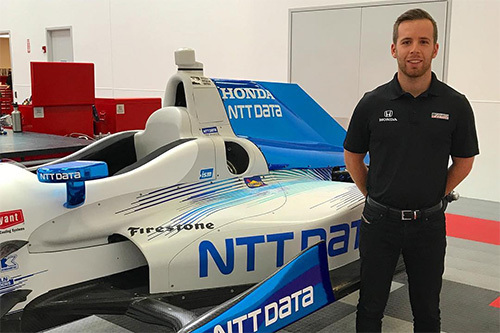 10 NTT DATA Honda beginning in 2018, teaming up with four-time INDYCAR Champion, Indianapolis 500 Winner and 41-time race winner Scott Dixon. The 2017 INDYCAR Rookie of the Year scored a best finish of third at the Indianapolis 500 this season after taking the Indy Lights Championship in 2016 on the strength of two wins and nine podium finishes. In 2016, Jones captured the Indy Lights title and the Mazda scholarship with two wins, eight podium finishes and eight pole positions. In 2015, he made the move across the Atlantic with Carlin Racing and into Indy Lights. Jones served notice of his title aspirations right out of the box, earning the first three race victories of the season – the first rookie driver to do so. He went on to finish third in the title chases. Prior to that, Jones earned several karting titles in his native Dubai before making his race car debut in the 2011 European Intersteps Championship. In 2013, Jones became the youngest European F3 Open Champion in history with six wins, 10 podium finishes and four pole positions. Chip Ganassi has been a fixture in the auto racing industry for over 30 years and is considered one of the most successful as well as innovative owners the sport has anywhere in the world. Today his teams include four cars in the Verizon IndyCar Series, two cars in the Monster Energy NASCAR Cup Series, two cars in the NASCAR XFINITY Series, two factory Ford GT’s in the IMSA WeatherTech SportsCar Championship and two factory Ford GT’s in the FIA World Endurance Championship. Overall his teams have 18 championships and more than 195 victories, including four Indianapolis 500s, a Daytona 500, a Brickyard 400, seven Rolex 24 At Daytonas, the 12 Hours of Sebring and the 24 Hours of Le Mans. Ganassi boasts state-of-the-art race shop facilities in Indianapolis and Concord, N.C., with a corporate office in Pittsburgh, Pa.